Friends of Huntley Meadows Park (FOHMP) has been working very hard to ensure that EMBARK fully reflects an environmental vision that promotes a healthier environment with all redevelopment. This includes ensuring the protection of the rarest habitats, plants, wildlife, and historic resources of national and global significance here in Fairfax County. 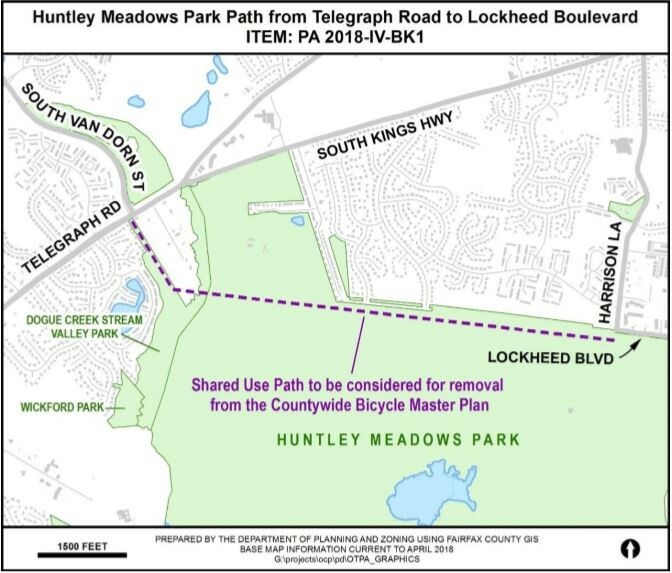 As part of the EMBARK Plan Amendment approval by the Fairfax Couty Board of Supervisors in March 2018, there were follow-on motions by Lee District Supervisor Jeff McKay and Lee District Planning Commissioner Magliaccio concerning two paved bicycle trails (not yet constructed) that would cut through Huntley Meadows Park (HMP) in both the northern and southern sectors. FOHMP supports Supervisor McKay’s and Commissioner Maglaccio’s request for Comprehensive Plan Amendments (PA #2018-IV-BK1 and PA # 2018-IV-TR1) to remove these paved trails from the Comprehensive Plan and from the Bicycle Master Plan, due to their expected severe adverse impacts on sensitive natural and historic resources. Those who look at nature in a sort of sentimental, Disneyish way are often shattered when they witness some of the harsh realities of the actual world. More than once, I’ve tried to comfort people who watched a Hawk swoop down on their bird feeder, grab one of “their” Chickadees, and then calmly tear it apart in their yard. They are devastated by this ruthlessness. A previous edition of this newsletter contained a bit about brood parasitism, another fact of nature that some find appalling. Brood parasites lay their eggs in the nests of other birds, and do not provide any parental care for their own offspring. Care that the "hosts" provide to the young parasites is care denied to their own young. This can have a detrimental effect on the reproductive success of the hosts and may affect their population numbers as a consequence. If we can look at these occurrences without judging them by human social conventions, and instead see them as an integral part of nature, our joy of being outside will grow. However you perceive the creation of our world, what has developed is a natural outcome of that creation. The Hawk taking the Chickadee is an expression of the natural world. The Hawk has to eat, too. And its diet includes Chickadees. The nest parasitism discussed in our last newsletter is also a natural behavior for some species. 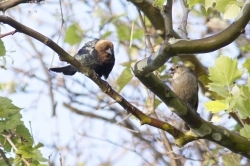 The nest parasites we encounter in North America are usually Brown-headed Cowbirds. Parasitism by Cowbirds is increasing and has been reported as high as 70% (i.e., 70% of found parasitized nests had Cowbird eggs in them). The main reason for this increase is probably habitat fragmentation. The Friends of Huntley Meadows Park supports a wide range of programs throughout the Park. Your membership dues and donations are critical to the success of our organization. Creation of Huntley Meadows Patches, now on sale in the Norma Hoffman Visitor Center (VC) gift shop. Scholarships to support three interns for the summer of 2016. These interns will complete much needed programing projects. But most importantly they will assist Staff during day camps that educate and enter-tain our next generation of naturalist and environmental stewards. Environmental protection apprentice who will study with Park experts to learn best practices for wetland, forest, and meadow management. Quarterly newsletter to keep our 450+ members up-to-date on what is happening at the Park. Newsletter expenses have fallen with our “GO GREEN” initiative to provide more newsletters by email. Printing of various Park brochures and the frog stickers that adorn so many young visitors. Specialized training for Staff. This is usually several thousand dollars annually. School trips for schools throughout Fairfax County and neighboring counties. Kids are our very best ambassadors - we hear from many visitors that their kids visited on a school field trip and wanted to come back to show their families what a special place Huntley Meadows Park is. A donation to the Raptor Conservancy, one of our biggest entertainers on Wetlands Awareness Day. The contribution is used to feed and care for beautiful birds of prey that can no longer live in the wild. Generate merchandise to sell in the Visitor Center gift shop, e.g., hats, shirts, magnets, and lapel pins. Purchase of tools, and supplies for trail restoration, planting, invasive removal, and field studies. Production of the annual photography show, which celebrates local photographers and their work snapped at the Park. An ad for FOHMP in the playbill for West Potomac High School’s production of Starlight Express. West Potomac students help us each spring with watershed cleanups. The Friends of Huntley Meadows Park was founded in 1985 and is a nonprofit organization of individuals dedicated to the protection of Fairfax County's premier wetland wildlife sanctuary. FOHMP was organized exclusively for charitable, scientific, and educational purposes and operates under Section 501(c)(3) of the Internal Revenue Code. The Monday Birdwalk takes place every week, rain or shine, at 7 AM, is free of charge, requires no reservation, and is open to all. Birders meet in the parking lot at the Park's entrance at 3701 Lockheed Blvd, Alexandria, VA. Questions should be directed to Park staff during normal business hours at (703) 768-2525. Friends of Historic Huntley is a non-profit citizen group committed to working with the Fairfax County Park Authority to assure the preservation, restoration and appropriate use of Historic Huntley and to enhance the public’s knowledge of the site and the broader historic development of the neighborhood.